Blasch ceramic ferrules provide more effective waste heat boiler tube protection and allow for much greater design flexibility than traditional refractory systems. This is accomplished through the separation of the structural and insulating functions of the ferrules. There are a number of options available, depending on the specific details of your particular equipment. At the 2017 Brimstone Vail Conference, Clinton Schulz of CITGO Refining and Chemicals presented results that his plant has realized utilizing a patented ferrule design which was engineered in cooperation with Blasch in 2005. Download his full paper to find out how patented modifications to the Blasch Ferrule design have resulted in longer boiler tube life due to reduced peak heat flux. To find out more, download the full paper as presented at Brimstone Vail. Patented Blasch boiler tube ferrules are pre-engineered for each and every boiler tube installation. Customers can expect to receive ferrules that are properly sized, accurately molded, and completely wrapped with all required fiber insulation. Installation is as simple as taking them out of the box and slipping them into the boiler tubes. Castable refractory is not necessary between the ceramic ferrules and only the most minimal amount is required around the periphery. Operators can save days on turnaround without the need to painstakingly install, and then cure out, large expanses of castable refractory. Our patent-pending ProLok™ twist and lock two piece ceramic ferrules have several advantages over traditional one-piece systems and offer increased reliability over traditional two piece ferrules. By separating the ferrule head and stem, stress is removed from the concentration point where the two connect in a one piece design, allowing for better thermal expansion tolerance. Other precast boiler tube ferrules are designed to be installed with some amount of protective barrier consisting of mortar between the ferrules which creates a problem when ferrules heat up and expand. The mortar is crushed during this expansion and can fall out after repeated cycles, leaving a direct path to the tubesheet. Blasch ceramic ferrules for boilers are engineered to come to closure at operating temperature without the need for this secondary protective barrier. 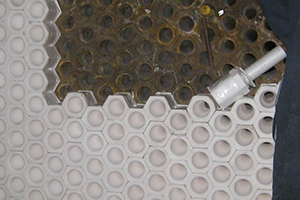 Watch how quickly and easily our ceramic ferrules can be installed. See the superior thermal shock resistance of 99.7% Ultra High Alumina Ferrules. Improving and maintaining the mechanical reliability of the sulfur recovery unit (SRU) is critical.